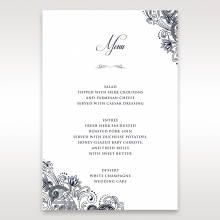 Are you planning an elegant event? 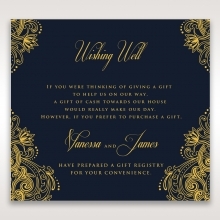 Your wedding invitation will be sure to awe your guests when it is enclosed behind golden gates. The delicate and intricate laser cut design of the gates is beautifully cut into foil, with golden gates opening to reveal the beautiful invitation insert within. The paper stock is a high quality, German imported navy coloured piece. 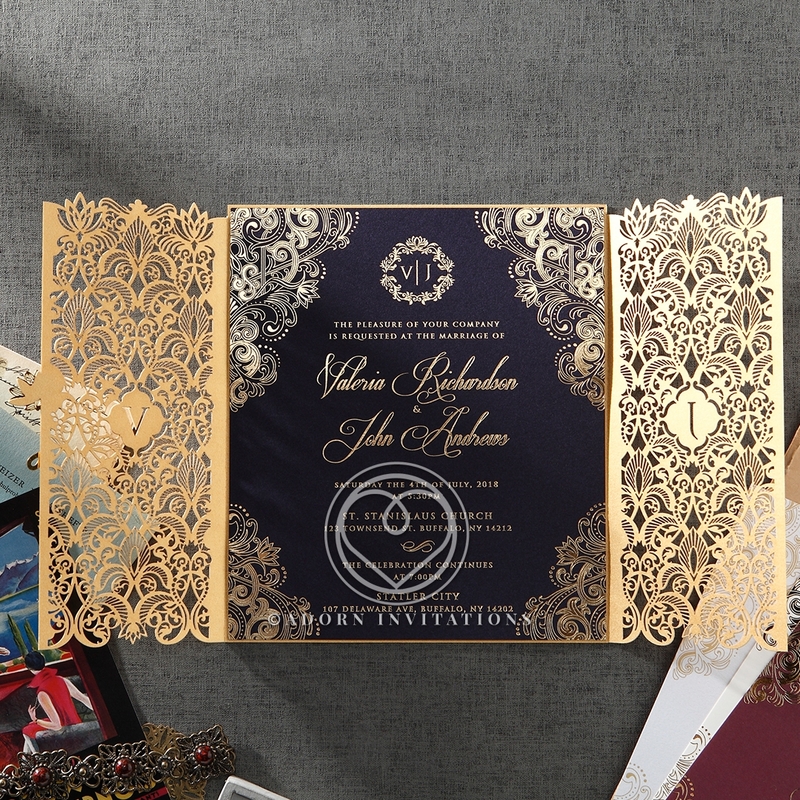 The invitation itself is printed with the hot foil stamping technique, with details echoing the intricacy of the gates themselves. 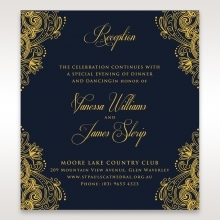 The combination of navy with the gold foil is exquisite, and will set just the right tone for your prestige event. INSERT PAPER: Navy Cotton 300GSM. Not Customisable. Beautiful cards with lots of details and the delivery was very fast!!! If you want to knock your guests off their feet the moment they see your invitation then ....this is the invitation for you! This invitation is beautiful and elegant the moment you see it you're going to want it trust me i wanted something simple for my wedding invitations and yet the moment i saw this invitation I must say it was breathtaking not only because it's gorgeous but because it's very high quality. I ordered this sample only last week and it is absolutely beautiful. 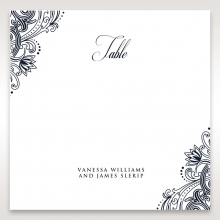 I am SO excited to order my invitations now and to treat my guests to such a stunning piece of stationary. Unbelievable! I received samples from other companies for my upcoming wedding but they fail in comparison. The quality of these invitations are top notch. The foil embroidery is beautiful! Not to mention the laser cut lace pattern on the actual invitation. Moreover, the price compared to other companies is reasonable. 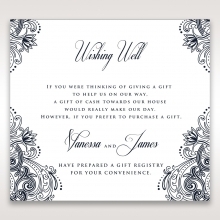 You may find cheaper options but you're required to construct the invitations yourself, which is not worth the effort. These invitations are perfect. I was recommended to Bweddinginvitations by a couple of engaged girls on a private Facebook group. At first I was hesitant because I couldn't believe that their samples were a $1. I thought that the invitations would look cheap due to their sample prices, however that was not the case. The samples were amazing, they looked amazing. I ordered 11 samples and fell in love with all of them. This invitation was my all time favorite because their color and attention to detail look so elegant. I will be ordering 80 wedding invitations from this website. I’m currently in the search for wedding invites for my upcoming wedding in 2018. We ordered many samples from other websites, but were not satisfied with what we saw so far. 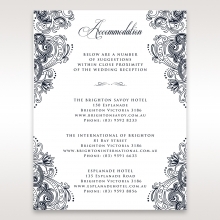 An ad for BWeddingInvitations.com and we were very intrigued by their designs. We ordered the Imperial Glamour- Navy sample since it matched very well with our color theme. Within 6 business days we received our sample in the mail. The invitation was stunning. I loved how the colors contrasted and complimented each other at the same time. It’s elegant and simple at the same time. We were also given samples of the rvsp, wishing well and reception cards with and without the hyphen stamp foil to get a good comparison. I really liked there was a sample card of the different color options for the hot stamp foiling. 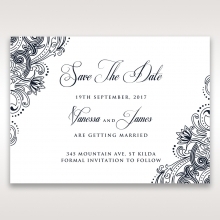 I will most likely order my wedding invitations from BWeddingInvitations.com and I’m sure my guests will enjoy them as much as we do. I received my sample and couldn't believe the quality of it. The gold foil is as radiant as the image and the laser cutting as precise and clean as I imagined. We will be ordering our invitation suite asap! Can't wait! I showed the invite to my fiance and he fell in love with it. We recently received our order of the invitations, direction cards and thank you cards, and they are truly gorgeous and fantastic. The price was pretty decent.. My fiance and I are extremely happy, and can't wait to give them to our guests. very satisfied with the product and service. Highly recommend. My invitations came out great and the price was reasonable. It was pretty inexpensive to begin with, compared to other online shops, but free assembly was a great deal. There was no hidden cost. That's what I really like about this site! Received the sample and was pleasantly surprised. Well made and good quality. The card is very elegant looking. The intricate, laser design is beautiful. The gold foil printing exquisite. Love it! My fiancee absolutely loved it and very happy with the choice we made. Really looking forward to make these our wedding invitations. Also, the customer service was very helpful. answered my question, and took responsibility when there was a mistake. Never blamed it on me. That's the company you want to associate with. Awesome invitations. Customizing was easy, and the price was reasonable. A lot of people have asked me where I got my wedding invitation and I have been telling them this site. Nice service and good price. I received a sample and liked this invitation for its uniqueness and inexpensive price. Assembly is done at no extra charge, which makes it even better. The printing seems great and love the ribbon. 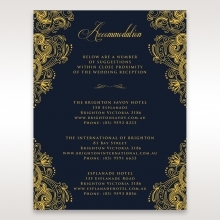 very nice invitation at a reasonable price. Free assembly seems like a great deal. this is a beautiful invitation. The quality is pretty good too. I am extremely impressed with the papers they use. These are really high quality paper stock at affordable prices. I love the detailed cuts on this invitation. 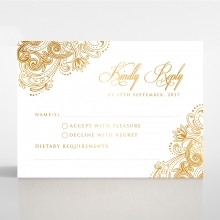 Very easy to customize and order invitations through this website. Happy with the service and the product. Highly recommend. I was so happy to find a pretty and affordable card. I browsed around for awhile on different sites to find my wedding card. And for the price, it was really a good deal. Very pleased! I love these invitations. I spent over two months looking for the perfect invite and I finally came across Bwedding. 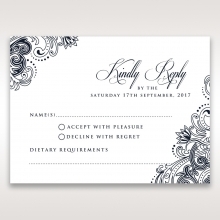 I fell in love with these invitations since I first saw and I could not be happier with my selection. I would recommend these invites any day! I am getting married in El Salvador so I needed some of the invitations to be printed in Spanish. This was no problem at all and I was able to have the same wedding invitation for my family in El Salvador printed in Spanish, and my fiance's family here in California printed in English. The quality is great and the Bwedding customer service is outstanding. Thank you for giving me the perfect wedding invitation. I absolutely love this invitation. It is unique and beautiful and best of all I didn't have to pay an arm and a leg, thanks for the free assembly. The sculpted flower is really delicate and beautiful. You can feel the texture and it really stands out. I've gotten so many great compliments. I LOVE IT!! I highly recommend this invite. It is beautiful, stylish and excellent quality for the price!!! Ordering was surprisingly simple, and the free assembly really helps. I got this invite with white insert and they turned out absolutely beautiful and high quality. These detailed laser cut invitations are really unique and fun. I love them. I also got the response and direction cards and they're just as pretty as the invitations. I'm totally satisfied with everything. I'd gladly give 5 out of 5. Awesome invitation package! The quality was great and everything was assembled for free. I absolutely positively love my invitations. I was at first rather stunned by the vibrant colors of this invitation, but after seeing the quality of the sample, I'm very pleased. The price is great especially for the quality. this invitation was just what I wanted. We’re having a church wedding and I wanted really elegant but modern wedding invitations that could reflect our love and friendship. I chose a red combination and they look really beautiful. I also love the envelope with gold that they come in. 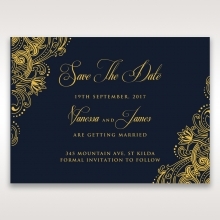 I love the design of this invitation and the navy & gold goes with my bridesmaids' dresses. I'm totally satisfied with the service and really glad I found this website. So many people have commented and asked about my invitations. It's a pleasure to share good things with friends. I highly recommend this site, and this invitation in particular!! very nice invite! Great design, fantastic quality and service. The website was easy to navigate and the prices were probably the lowest I've seen for this kind of quality. Highly reccomended. I can only say so many good things about this wedding invitation. Cool design and excellent quality. Highly recommend ordering from this company. I instantly fell in love with this design. The gold and navy matches my wedding colors and the response cards were just as pretty. I just started sending them out and already people are ranting and asking where I got them. When I tell them about this website, they’re all surprised because the quality is amazing! This is a great invitation site and I highly recommend to others! I’m so proud of myself for finding this site. I had a few more designs in mind but decided to go with this one because it is so elegant and has the greatest value for quality. My fiance found this site and ordered samples and we both liked it for its simple and elegant style. We were impressed with the high quality of the papers and the fact that the layer card was assembled without any extra charge. 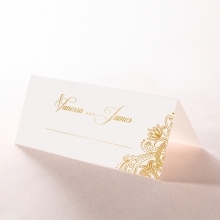 this invitation appears white on screen, but its actually light cream color and the paper is pearlized so it’s shiny. It’s actually really pretty. The actual card is better than the picture and the quality is far better than expected. 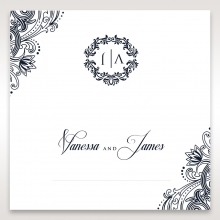 I’d recommend this product to anyone looking for decent wedding invitations online. 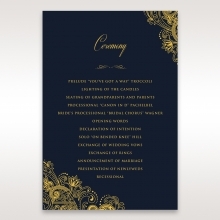 very nice wedding invitation with good quality. The yellow and chocolate invitation would fit my wedding colors perfectly and the plum blossoms look beautiful. They didn't send me any matching cards for the sample, but they also look pretty decent. Great design! Excellent quality! This product also comes with a pocket that is really unique and very formal looking. My fiance and I decided to order half with the pocket and half without. It worked out great. We’ve gotten rave reviews for both. I highly recommend this product as well as the pocket style. Love the classic design. 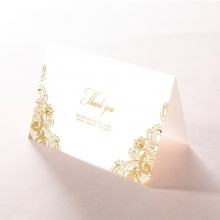 The pearl paper makes the card really elegant and the blue/gold combination is beautiful. What beautiful invitations! Absolutely lovethe vibrant colors! 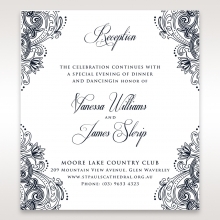 The layered style makes the invitations very sturdy. These are fantastic paper stock and superb design. I got the blue combination which fits my wedding color scheme, and they're absolutely positively the most beautiful wedding invitations I have ever seen! I highly recommend to others. First time I laid my eyes on this invitation card I just knew this was it. I showed the sample to my fiance and he gave his top vote. 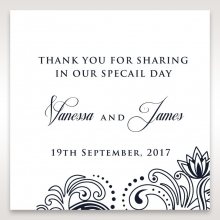 We just placed the order and I feel as if a huge weight’s been lifted because I had spent weeks on selecting our wedding invitations. I know I made the right choice since this is a beautiful, high quality invitation. I’m really glad I found it and can’t wait to get my order. Based on the sample I have, it looks exactly like the online photo except the paper quality is far better than expected, very sturdy and lavish looking. The printing job also looks very professional. I got my beautiful invitations a while ago. They were absolutely gorgeous, and I got lots of compliments from people I invited. 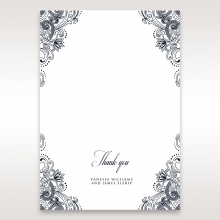 I came back to order Thank You cards and wanted to say Thank you to B weddinginvitations.com for excellent product and services. I highly recommend this site and their invitations. I ordered a coloured image insert (of our venue) which is really sweet and artsy. I love the gold lotus leaf, so cute and stylish. I highly recommend this product. They’re worth every penny. I also appreciated the ‘pre-assembly’ which saved a lot of time and energy on my part. I just got my wedding invitations and I'm extremely happy. My invitations are white with black die cut, which matches my wedding colors perfectly. I love the mat papers and matching enclosures line up nicely to make a perfect picture. I highly recommend! I was searching for months for a really unusual wedding invitation and found this amazing invitation. It is beautiful, sophisticated, unique and elegant. Everything I have been looking for. Top quality materials and craftsmanship. Excellent! I was browsing for my daughter's wedding invitations and ran into this website. The first thing that attracted me was all the rich colors. Only if I had known wedding invitations could be this exciting and full of character during my time! I've placed an order for a sample, and I'm thrilled to show my daughter. I love my wedding invitations! The paper is a good quality card stock, and the invitations were very easy to personalize. I was able to make it look exactly the way I wanted it to.Customer service was quick to respond to any and all of my questions and made the one change that I asked for when they sent me the proof. The invitations were shipped quickly and efficiently. I have nothing but good things to say! I can't say enough about how awesome B Wedding is. They were patient and friendly even though I made a million changes on my invitations. The staff always emailed me and called before every little thing was done. It relieved a lot of my stress to work with a very efficient and professional staff. Even though we were on different time zones, I remember them calling me outside of their office hours which really impressed me. The invitation were beautiful, better than expected, and I got so many compliments on how modern and beautiful they were. My cousin who is getting married next year is now using this vendor for her wedding invitations. the customer service was friendly and knowledgeable. From giving me advice on how to incorporate my wedding colors into the invitation, to checking in after I’d received the invitations to make sure I was happy with them. I highly recommend this vendor! Im very happy with my invitations. It was too good to be true when I found this invitation. It was everything I was looking for from design, color and quality. I especially the regal touch the gold foil adds. My fiancee voiced his happiness for them as well. I can't wait to start send these out of my family and friends. Overall very satisfied with the company and quality of their products. Words cannot explain how wonderful my invites came out. I was nervous because I'm not used to ordering things online, but I just love the design. When I got them, they totally surpassed my expectations. Overall, amazing vendor to work with, highly recommend them to everyone! Wow was my initial reaction. These invitations completely surpassed my expectations. I'm to send these out! Me and my fiancee are overall happy with using this vendor. Great service and easy to work with. Great service and amazing quality invitations. Totally met and surpassed my expectations. I got so many wonderful feedback from my guests. I came to this site from a recommendation from a friend and I couldn't believe all the amazing options I had. When I got my invitations I am amazed at how elegant they looked in person. Totally recommend there service!